I never thought I'd look to CNN and MSNBC for the truth, but the liberals seem to be presenting a good case against one of their own (Donald Trump). Let me know when something the left is proposing actually materializes as fact. 'Not what I read. 'Said opinions were split on that. And if we give our president the benefit of the doubt, that it was not obstruction of justice, have you considered what this is all about? It's about President Trump thinking, "That's not a good use of your time and resources, so stop doing it," and Comey thinking and saying and acting like, "No." I was hoping that a Trump lemming would come forward and attempt to refute this information. Care to be the first to attempt to do so? This under the heading: "What I am doing for you"
Documentation of Trump lying in a 2007 2 day deposition 30+ times (since he was under oath, that makes Donald Trump a perjurer) is a good start. 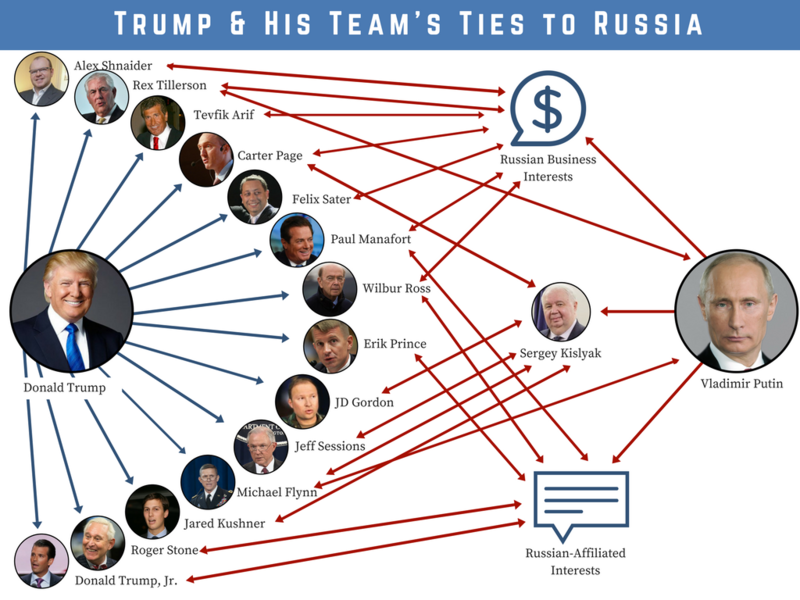 And how is this an attempt at a rebuttal about Donald Trump and his inner circle's close ties with Russia? After you attempt to refute the Russian connection, we can talk about Donald the Degenerate's past anti gun stance. After you refute the Russian connection, we can talk about Donald the Degenerate's past anti gun stance. By "refute," do you mean, convince others to ignore double-ended red arrows on an incomprehensible graphic? That's self-evidently already accomplished in the production and display of said graphic IMO. It looks like something a five-year-old would find important, which is exactly why I mentioned the gun rights record of the individual responsible for the source website that you invoked. I posted the link below the chart. If you need help understanding it, ask someone like me who doesn't play partisan politics, but is only interested in the truth. Don't be too hard on the democrats, the guy you're attempting to defend was one for most of his life (then Trump figured out how to get elected: run as a republican because republicans are so gullible). That's the website that supports the """"Assault Weapons Ban (AWB)"""" !!! Now I realize that you live for guns, but this isn't about Donald Trump's anti gun stance a few years back, it's about his and his inner circle's close ties to Russia. And most recently, that weirdo Sebastian Gorka. A White House spokesperson "insisted that Gorka did not resign but rather was forced out," according to the Washington Post. Not really. I think Gorka made it pretty clear, himself.